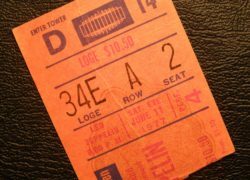 Item description: Led Zeppelin ticket for the 11th June 1977 concert at Madison Square Garden, New York. Typical MSG large style stiff card tiicket in orange with dark blue and red over printing. Condition report: Typical used MSG ticket, cut in half by the doorman as the ticket holder went in. otherwise very good to excellent condition. Background to Led Zeppelin 1977 Tour : This was the first tour embarked on by the band following their enforced layoff caused by Plant’s car accident in Greece in 1975. During this sabbatical, the band had recorded their seventh studio album, Presence. Rehearsals for the tour eventually took place at Manticore Studios, Fulham in early 1977, where the band worked for two months on a new set list. Led Zeppelin’s manager Peter Grant conceived this series of concerts as an effort that would reassert Led Zeppelin as the dominant band of the decade. Fifty one concerts were scheduled over a three-leg period, for 1.3 million ticket holders. 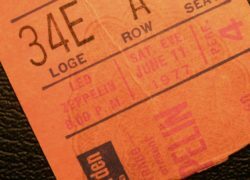 It was Led Zeppelin’s biggest ever tour, and tickets sold at a rate of 72,000 a day. The tour was scheduled to commence on 27 February at Fort Worth, Texas, but Plant contracted laryngitis and the schedule was postponed for a month. It eventually kicked off on 1 April, at the Dallas Memorial Auditorium in Dallas. The delay reduced the amount of time the band had available to rehearse, since all their equipment had already been airlifted to America. Provenance: Acquired in a New York Estate sale held in March 2011. Signed document of provenance sold with the ticket.